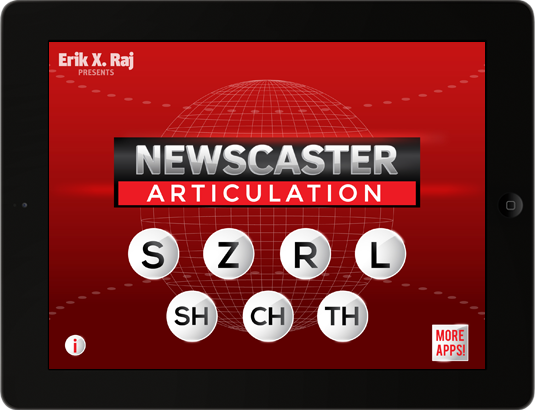 Newscaster Articulation is a comprehensive collection of over 450 sound-specific picture prompts that transform students into television newscasters. Designed for speech-language pathologists, this video-based application was made to be used with youngsters who exhibit difficulty producing the following speech sounds: S, Z, R, L, S/R/L Blends, SH, CH, and TH. It is intended to aid in the remediation of articulation impairments, as well as auditory and language difficulties because students often need practice in more than one area of communication. 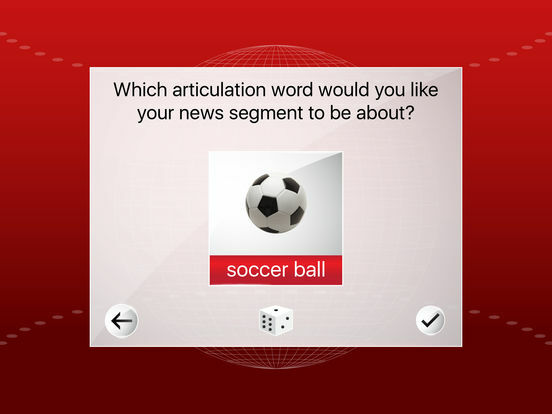 Tons of sound-specific picture prompts: with just a tap of a finger, children and clinicians can instantly add one of over 450 sound-specific picture prompts directly to their news segment! 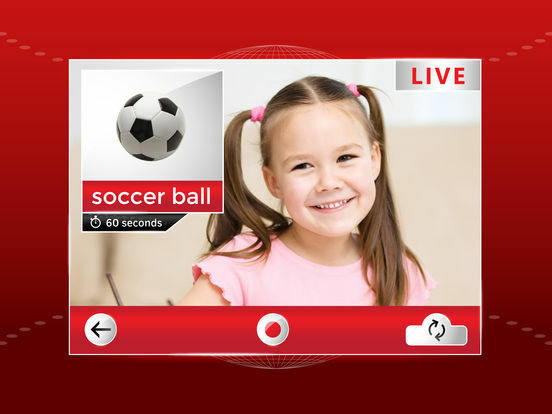 Video recording functionality: children and clinicians truly enjoy the audio-visual experience with video recording their very own new segments! A spectacular save feature: after video recording a news segment, tap the Save button to save the video directly to the device’s camera reel! Lights, camera, action! Have you ever wanted to be a television newscaster? Well, today is your lucky day. Newscaster Articulation sets the stage for a mock television broadcast by taking advantage of video camera technology. Through this exciting application, students are able to video record themselves presenting realistic-looking television news segments. All a user has to do is choose which speech sound he or she is working on. Then, a sound-specific picture prompt will appear in the corner of the video screen and that is when the news report can begin! 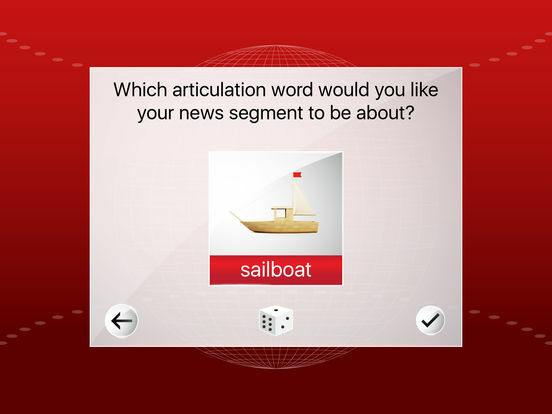 Encourage your student to make up and verbalize a story about the featured sound-specific picture prompt while Newscaster Articulation video records the student’s news segment. Afterwards, review the news segment by watching it together with your student to discuss his or her articulation progress and further practice proper pronunciation and articulation strategies. 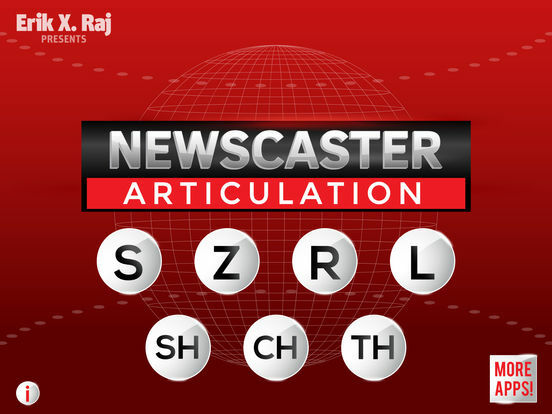 The format of Newscaster Articulation is a departure from traditional articulation drill materials and is effective for students ages 6 and up. Because of the mock television broadcast approach, students enjoy video recording news segments with their friends and classmates outside of the speech therapy room, further practicing their communication skills and thereby facilitating the sometimes difficult stage of carrying over newly-acquired skills. By talking about the news segments with the youngster, paraprofessionals in the classroom and/or parents at home can reinforce the targeted articulation skills while sharing a fun activity. Practicing these skills in environments outside the speech therapy setting increases opportunities for generalization. 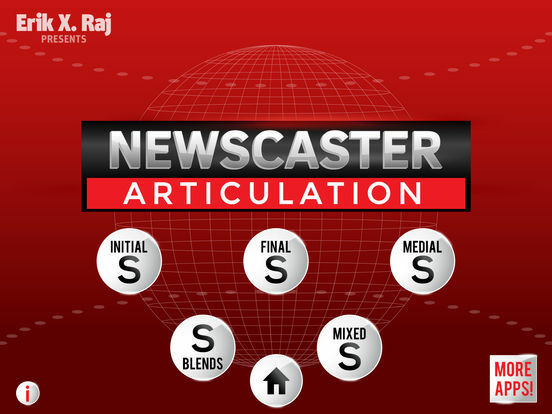 I invite you to use Newscaster Articulation to spice up your speech therapy sessions. All of the sound-specific picture prompts are intended to initiate excitement and humor. And in all honesty, each news segment has the potential to spark stories that could lead almost anywhere. Even a sound-specific picture prompt that appears simple can trigger a unique thought that surprises all parties involved. Regardless of when, where, or how Newscaster Articulation is used within the speech therapy session, one thing is certain, children (as well as clinicians) will have a blast video recording news segments and talking about them . . . and in the process, all of the youngsters will continue to practice the correct pronunciation of their sounds. So what are you waiting for? Let your imagination run wild and have fun with this one of a kind video-based speech therapy material!